Do you want to know how did successful people make it in life? Successful people who went on to accomplish the outstanding feat in life are extraordinary people. They are a different breed and they do things differently than average people. That’s why they are successful. And in this article, you will discover the 10 extraordinary qualities required to be successful. Before we move on to the 10 qualities, I must warn you that the journey to becoming successful is not an easy one. There will be many sleepless nights, you will have to go through thick and thin, you must choose to go on even when everything goes against you, and most importantly, you must believe in yourself. And because it is not an easy journey, only the minority is able to achieve and accomplish it. This is what makes being successful even more valuable. Think about it, if everyone has superpowers, no one will be special anymore, everyone will be the same. The journey is tough, but the rewards will be well worth it. Are you ready to make it big in life? You can be a successful entrepreneur and build a multi-million dollar business. You can be an author and write not just one, but several international best-selling titles. You can be a famous actor that everyone knows and talk about. If you want to produce outstanding success in life, you must be self-centered. No, self-centered is not the same as selfish or being a narcissist. It is about becoming who you truly want to be, without thinking much about how others think about you. Too often, people are too afraid to live life according to their own terms because they are afraid and they worry too much about how others look at them. They work because that’s what everyone is doing after they graduate. They get married because their parents ask them to. They don’t dare to chase for their ambition because someone told them that it is impossible or they simply don’t believe that they can do it. Successful people, on the other hand, are self-centered. They don’t really care about what other people think about them or how other people look at them. They live life at their own rules and they do things according to their own conscience. Look at Steve Jobs. He lived a hippie lifestyle. He did not bath for days and he went to his workplace barefoot. He ate only vegetables and there were times he only took fruits as meals. Did he care how other people look at him? The answer is absolutely not. When Jobs was young, he even went to India to search for enlightenment in life. He was someone who is so self-centered that he even parked his Mercedes at handicapped lot back in his Apple office and don’t care much. What about you? Are you someone self-centered? Or are you someone who lives life following the crowd? If you want to be extraordinary, you must do something that is out of the norm. You must live your life your own way. Be self-center and stop thinking about how people think about you. When you are 18, you worry about what everyone is thinking about you. When you are 40, you don’t give a darn about what everyone thinks of you. When you are 60, you realize that nobody has been talking about you at all. The fact is that nobody is thinking about you at all. Everyone is busy and they will be thinking about themselves most of the time. So don’t spend your life thinking about how others look at you. If you have a dream, go for it. Stop thinking what if you fail and how your friends will look at you; stop thinking if your colleagues will look down on you. This is your life and you only get to live once. If you don’t do it now, there won’t be any chance left for you. It’s now or never. Choose to live life according to your own direction. Decide today that you are not going to think about how other people think of you. The most important thing is how you look at yourself, not other people. Thus, be more self-centered from now on. Another quality of successful people you must adopt is to keep on striving for excellence in what you do. If you want to be successful in life, you must become the best in your industry. You don’t want to be just average, you want to be the master where people will come to your service or product when they need it. How did you think that Apple is able to capture the majority of the mobile phone industry? They innovate fast enough and they keep improving their i-Phones. By the way, I like to use Apple and Steve Jobs as an example because I read Jobs’ biography and I was fascinated with his life and journey in building one of the best tech companies in history. If you look at how Apple or any other successful companies such as Microsoft, Dell, Google, and Amazon evolved, you will discover that they keep innovating and improving their products and services. Google become the top search engine in the world, their main page, Google.com may look the same for years, but did you know what did they do at the backstage? They keep improving their search engine algorithm. They get rid of spam, make their search results more relevant and strive to get the most quality results for their users. Google is the biggest search engine today, but why do they still want to improve? They are already capturing a huge share of the market. Chances are, you will be using Google to search for information on the internet, most people do, but they are still striving for excellence. If you are not improving, you will be dying. Imagine yourself swimming in the swimming pool, what would happen if you did not move? You will drown. The same theory applies in business and in life. If you did not move or continue to swim, you will drown. The competition will take you down. New players will come into the market and take away your share. Technologies will improve and you will become outdated. This is why it is important to continue to strive for excellence. If you want to be the best in your field, there is no other way than consistently improving yourself, your business, your products, your services and your knowledge in the industry. How do you think successful athletes like Michael Jordan, Tiger Woods, Kobe Bryan, Lionel Messi and the rest are able to produce amazing results in sports? They train consistently and they commit to improving their skills every day. Michael Phelps, the Olympic swimmers who went on to win 28 medals once told a reporter that his daily activities are none other than eating, sleeping, and swimming. He spends most of his time in the pool, swimming and improving his skills. What about you? What do you do most of the time to hone your skills? Or do you spend most of your time checking social media and playing games? Commit to investing in yourself. Start by reading at least an hour a day. Buy a few highly recommended books that will inspire you and read them. If you are right on budget, don’t worry, buy just one book and reread it over and over again. Do you know that Warren Buffett read The Intelligent Investor by his mentor, Benjamin Graham for many times until he successfully grasped the insights within? Therefore, create a schedule to read books from today onward. Another hidden quality required for success that most people never talk about is delay gratification. When you receive $100 bonus, what would you do with it? Are you going to spend it all in shopping or are you going to save it and invest it? Successful people choose to delay gratification. They choose to work hard right now and get a bigger reward later. Average people choose to get the reward instantly and in the future, they will have to work hard to pay for their instant reward choices. When you study extraordinary people like Michael Jordan, Michael Jackson, Steve Jobs, Richard Branson, and Soichiro Honda, you will notice that these people choose to work hard on their dreams even when they can just quit and work for a stable job. They choose the hard way because they want a bigger reward later. If you are having sweet time right now, you will have to suffer sweat time later. It’s a choice that you have to make. It is either you work hard right now, or you work hard later. Thomas Stanley wrote a book called The Millionaire Next Door. And in this book, he said that most self-made millionaires will never buy a new car. They prefer to go for the used car. Why? The answer is simple, when you buy a new car, the value of the car will greatly depreciate within the first 3 years. Thus, if you get a used car, you will save a lot from there. This is what it means by delaying gratification. You can choose to play games and check the social media now or work on your goals. You can choose to exercise and jogging for better health or you can choose to eat junk food and suffer the consequences later. Whatever you do in life, there will be cause and effect. Effect: The new guy gets the promotion. Cause: You did not attend the sales training. Effect: You are broke or in debt. Cause: You did not learn how to manage your finances and you spend more than you earn. Effect: You are overweight and always feeling tired. Cause: You did not commit to exercise and working out. You eat, sleep and work in front of your computer. You did not move much. Effect: You are living the same life over and over again. Cause: You did not read and improve. You did not set goals and be serious with them. Now, these are some examples that we face in our everyday life. Here’s the thing, if you don’t like the effect, you can change it by changing the cause. Do something differently and choose to delay the instant gratification. What gives you immediate pleasure is usually something that will require you to work hard in the future. If a task requires you to work hard right now, do it. It might not give you instant pleasure, but it will definitely bring positive effect in the long run. Just like if you are building a blog, writing quality content may not give you immediate reward, but on the long term, the quality content will position your blog correctly in the search engine. The same goes in every area of life. If you choose to spend all your money and have fun right now, in future, you will suffer because you are broke or have nothing to invest. If you choose to have fun, play all day and are not working seriously, in future, you will suffer the consequences. If you don’t, choose to change. Change the cause and you will get a different effect. More importantly, choose to delay gratification. Everyone is copying one another and marketing has becoming hype these days. Nobody seems to care about over-delivering. Everyone talks about over-selling, but none of them over-deliver. If you want to be successful in what you do, you must always over-deliver. This is what will make you stand out and make you unique. Extraordinary people are better than the average because they over-deliver. Let me ask you this, why do people prefer to watch a professional tennis match than a rookie match? It is true that the tennis matches between professional players are more interesting, but why? The answer is that professional players go all out and they over-deliver in terms of their skills. You can tell from their face that they are committed to winning and they will perform with all their might. When Apple first launched the iPhone, nobody in the industry can match their standards. It quickly became a huge success and captured a big chunk of the market. However, as time went by, many other competitors are modeling their success and delivering the same product like Apple. It has become an industry standard and averages right now. Thus, if you want to shine in your field, you have to always over-deliver. Do more than expected. Call more prospects than your manager expects of you. Go the extra mile. When your boss wants you to do a market research, do a thorough research with a full analysis. Impress people with your capability. You don’t have to worry about the competition or if people will always expect you to do more in the future, you just have to over-deliver. When you over-deliver, people will appreciate your work and come to you. And when you become a demand, you can charge higher fees and command higher dollars. Why does a bungalow sell at a much higher price than a normal terrace house? So, what special values or any additional effort you have to put in to achieve your goals and be successful? What can you do more? What can you do so that other people will impress by your work? Here’s the takeaway – become so good that you become indispensable in your industry/work/job/company/business. H.L. Hunt, one of the richest men in America once said that success comes down to two things. First, you have to decide what it is that you want. You have to clearly define it. And second, resolve to pay the price to get it. Most people accomplished the first step, but they fail at the second. You see, a lot of people set goals, but the majority of them fail to achieve them. In fact, there is a study conducted by Scranton University about New Year Resolutions. The study reveals that as high as 92% of people who set their New Year Resolutions fail to accomplish them. And if you want to join the 8% who succeed, you must resolve to pay the price for success now. Too many people talk about becoming successful, but they are not willing to work on it to produce the results they want. They talk the talk but they don’t walk the walk. Do you know that everyone wants to live a successful life and they want to be financially free? However, when it comes to working on their dreams and goals, they always procrastinate and give lousy excuses why they can’t do it. They say that they want to build an online business, but all they do after they get back from work is watching TV or playing games or checking on other people on Facebook. What about you? Do you work on your dreams and act on your goals every day? Or do you procrastinate and give reasons why you can’t take action? If you are 100% committed, you will never give excuses. Instead, you will find a way to work it out. When the will is strong enough, it will be done. Hard work itself is not enough. What you do once in a while is not as important as what you do every day. Success is not about doing one thing once a year, it is about doing the work consistently, each day. Michael Phelps doesn’t train for just one day and manages to win the medals. He trains consistently, every day. You have to resolve today that you are going to work on your dreams consistently, every day if you want to be successful. One of the most powerful techniques I learned from Robin Sharma, the author behind The Monk Who Sold His Ferrari, is the Big Five strategy. All you need to do is to take 5 small action steps that will move you forward to your goals each day. It can be making a call. It can be sending an email. It can be writing a 500 words article. It can be saying “Thank you” to someone. It can be anything small that will contribute to your success. Now, if you do this, taking 5 action steps a day, you will be accomplishing 1825 victories in a year. Can you imagine how these 1825 small victories will lead you to your success? The accumulation of small efforts will give you big success over the long term. And this is how all successful people do it. They work hard on their goals and they act on their dreams, every day. They pour in small effort each day, and they get small results. And over a period of time, the small results will accumulate and give them a big success. So adopt this technique and take 5 small action steps each day. I love this technique; it is powerful and very effective. What you need to do is to simply time-block your task. For example, if you want to write an article, just time block say from 9am to 11am. And within these 2 hours, you will do nothing but focus on writing the article. By the way, this is exactly what I do every day. I time block my article writing each morning and make sure that I type at least 1,000 words a day. The result? This blog and this article you are reading right now. 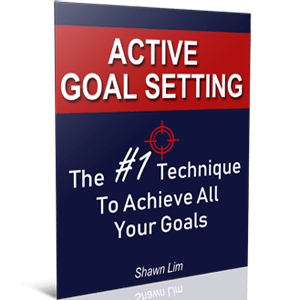 Use active time-blocking to take action that will give you the success you want. Michael Phelps time-block his training and swimming sessions, Warren Buffett time-block his research and investing work, and successful authors time-block their writing time, so what about you? When you time-block, make sure you are 100% concentrated on your task and never get distracted by other things. Lock yourself in the room if possible. These are the 3 insights that can help you in taking action and paying the price to achieve the success you want in life. Use them wisely. More importantly, don’t just read about this, apply what you have learned into your life right now. This is another key quality of successful people. Not only that they are consistent with their work, their goals, and their dreams, they have strong self-discipline. If you don’t have the discipline to put yourself into taking action, you will never accomplish any of your goals or dreams. Brian Tracy, the success guru wrote in his book, No Excuses, saying that the first and the most important rule to success is self-discipline. It is the key that will determine if you will follow through all the other qualities. If you don’t have self-discipline, you will never set goals and you will never want to write down your goals. In fact, you won’t even read this article up to this point. We all know that success will never come in the short-term. And because of this, self-discipline plays an important role. When you first started your journey, you feel motivated and you have the willpower to wake up early, work harder and stay later. However, success is not a sprint. As the days go by, you will be distracted by your day-to-day mundane work, you will be tempted to want to procrastinate and watch TV instead of working on your goals. You will want to choose to continue to sleep rather than wake up and hit the gym. This is the point where successful people who have a stronger self-discipline stick to their schedule and do it. On the other hand, unsuccessful people will procrastinate, they give excuses and they stop taking action. If you are required to wake up at 5 am every day, can you do it tomorrow? Well, of course, you can, it is just for one day. What if you are required to wake up at 5 am every single day for 10 years, and you have to stick to this habit no matter whether it rains or snows? Can you do it? Do you have the commitment and the self-discipline to follow the schedule, every day? Most people don’t. That is why most people are just average. You see, success is not something that will come to you in an instant. This is why people without self-discipline find it difficult to create a breakthrough in their life. So how do you build self-discipline so that you will stick to your schedule and do what needs to get done over the long-term? First, you need to find out reasons why you want to do it. Your reasons will boost your motivation and the will become the supports when the tough times come. Revisit your reasons whenever you feel the lack of energy or don’t feel motivated. Remember, your reasons must be strong and emotion so that they will drive you. Second, once you have created a schedule that you can follow through each day, turn it into your habit. When an action becomes a habit, you will never need self-discipline anymore because you will do it unconsciously without much effort. Just like how you brush your teeth or the way you bath each day. You don’t spend time thinking about how to do it, don’t you? At the beginning, do your best to stick to your schedule. If you want to build a habit, you must be consistent with it. There’s a myth saying that to build a new habit, you need to stick to the action for at least 21 days. I’m not sure if this is real, but since you are going to do it anyway, so just stick to your schedule and do it for as long as it takes. Have you ever wondered how successful people seem to know everything and they just know the answer? Well, successful people are not geniuses, but they simply ask for it. And you can do the same. How do you think Steve Jobs managed to secure startup capital from angel investors? He makes calls and asks for it. When you don’t know how to do something, just ask around and you will get the answer. Of course, you want to ask credible people or people who have done it. If you ask a parrot how to cook, do you think you’d get the answer? No. So ask the right person, don’t just ask anyone. Ask people who are credible. If you want to learn how to invest in the stock market and make a consistent profit, ask people who have done it. Ask someone who is credible and have good track record. The same if you want to learn how to cook, how to manage a business, how to make money online, how to build a better relationship, etc. When you ask, you shall receive. I like one of the examples given in Jack Canfield’s book; he said that if you want to date someone, all you need to do is to just ask. If you did ask, and you get rejected, guess what, the answer is still a “no”, it is the same like if you did not ask. However, if you ask, you will at least get a 50-50 chance. Who knows, he or she might say yes, right? So don’t worry about it, just ask. If you did not get the answer you want after you have asked, it is alright, you are no worse than where you are. Do you know that success is a numbers game? The more you ask, the more likely you are going to get the right answer. The more you do and take action, the more likely you are going to hit the breakthrough that will catapult you to huge success. In life, there is something called the Equal-Odds Rule. This rule states that no matter whether you are an inventor, an entrepreneur, a scientist, a teacher, a writer, an actor or a worker of any type, your chances to produce a useless project is the same as an important one. It simply means that the best chance to produce something remarkable is to produce as much as possible. Just like Thomas Edison, he did not know which material is going to work in his light bulb invention, so all he did was to try with as many materials as possible. The more experiment he conducted, the more likely he will find the right material. And he did, after more than 10,000 attempts. If you are a blogger like me, you can never predict which article will become a hit and shares by millions. So your best bet is to keep producing and publishing articles until you hit the bull’s eye. This is how successful people do it. They keep pumping in action. There are days where extraordinary people produce lousy work, but there are also days where they produce outstanding work that makes them successful. More importantly, the more you try, do, take action and work it, the better you will become. It’s called deliberate practice. Imagine the first time you ride a bicycle, you’re scared and you don’t dare to ride fast. Once you have done it many times, you become a master and you dare to even try to do crazy stunts and tricks with your bike. So don’t be afraid to ask around. If you get rejected, or if you don’t get the answer you are looking for, remember the Equal-Odds Rule. Positive thinking is one of the most commonly talked about topics when it comes to living a better life. It is true that people who are successful are extremely optimistic. Once, I watched a presentation from Alibaba’s founder, Jack Ma, he said that after he got to know other extraordinary people such as Bill Gates, Larry Ellison, Mark Zuckerberg, etc, he found that they all have a common characteristic – being optimistic all the time. And I believe that Jack Ma is right. Every successful people are positive thinkers. They look at to the bright side almost all the time. Think about it, if you are being negative all the time, do you think you will want to venture and expand your business? If the market is slow, most negative people would brace up and cut cost on expenditures. People who are negative will never try new things because they don’t believe that it is going to work out and they think that they are going to fail. And since they believe that they are going to fail, they will never do it. Successful people, on the other hand, are extremely positive. They believe that the future will be bright and people want to buy their products and services. This is why they launch new products and invest more money into innovating better products. Let me ask you this, if you don’t believe that you are going to win the lottery, would you buy it in the first place? People buy lottery tickets because they believe there is a possibility that they might strike and win the prize. When you don’t believe that something is possible, you will never do it. Thus, think positive towards your future. Trust that everything is going to turn out alright and amazing things are coming your way. Even if you are in a tough situation right now, believe that things are going to be okay and the difficulties are just a test to build your character. Sometimes, things will be tough and you may want to give up. Sometimes, you will feel like no matter how hard you try, you can’t create the breakthrough. However, don’t give up. Keep thinking positive. Choose to look at the bright side. If you did not get the results you want after many tries, keep trying. Change your plan and keep taking action. When you are facing difficult moments in life, don’t quit on your dreams or settle for mediocrity. Trust that the moment will come. If you can get through the tough time, you can get through anything. Revisit your goals, your dreams, and your purpose. Always remind yourself of why you want to do it in the first place. Let your reasons drive you and let your past victories boost your confidence once more. As long as you don’t give up and continue to march forward, you will eventually arrive at your destination. First, you must choose to be optimistic, think positively and always look at the bright side. This is another extraordinary quality all successful people shared. They are always on the move. They are always in action. In other words, they are proactive and not reactive. Unsuccessful people are reactive. They wait for things to come to them. When they reach their office, they wait for instructions. When they back at home, they watch TV, play games or surf the internet for nothing. Successful people are proactive. They plan for their days. They know their monthly targets and they know what they need to do each day to reach their goals. They are the ones who go out and make things happen rather than waiting for things to come to them. So, if you want to be successful, be proactive. Be the one who works on your dreams and your goals and not the one who sits and do nothing. Be the one who changes your life rather than waiting for your life to change you. When most people were stranded in the airport due to flight’s cancellation, Richard Branson decided to do something different. He chartered a private plane and sold off the rest of the seat tickets to the stranded passengers. And that’s how he started Virgin Airlines. When Steve Jobs needed capital to start his company, he called numbers on Yellow Pages to pitch his ideas, and he succeeded. So you see, success is not easy, but if you are willing to work on it, it can be yours. Like what I have mentioned above, adopt the Big Five strategy and take 5 little steps each day. You will eventually reach your destination as long as you keep moving. Whatever you do, you have to keep moving forward. No matter how tough the situation is, just make sure you keep taking action and keep moving forward. Actions are the bridges that connect your dreams and your reality. Without actions, your dreams will remain dream. Most people are not successful because most people are afraid to take action. They are afraid what if they fail. They don’t do it because they don’t know how or they don’t have the time. They scare if they do it, they succeeded and what if they can’t handle it. And many other reasons. Never let these reasons stop you. Instead, use your reasons to put you into the action mode. Some people say that they are not successful because they were born in a poor family. While some people say that they are successful because they were born in a poor family. Which one do you fit in? Do you let your reasons to stop you? Or do you use your reasons to build success? It is your choice. Some people say that they are poor because they don’t have extra money for investment. While some people say that they must invest because they are poor and they want to get out of the rat race. Which one are you? So turn your adversities into your advantages. Don’t worry if you fail. Don’t worry if things don’t work out. All you need to do is to keep trying until you succeed. If you fail, so what? Just improve your strategy and do it again. When you are a baby, you try to walk, you fall, but you did not let those failures stop you. You improve your way, you try to hold on things and you try again and again and again until you walk like everyone else did. Therefore, if you have a dream, go for it. Keep trying and trying and trying until you materialize it. A very common quality of successful people, yet, it is something most people lack. How determined are you toward the success that you want? Are you willing to do whatever it takes and are you willing to sacrifice your leisure time for it? Or you prefer to do what is convenient rather than what you have committed. When you write down your to-do list and you have 3 more items left undone, would you sacrifice your sleep time and get them done before you sleep, or are you going to just ignore your to-do list and choose to go to bed anyway? What you do and how you choose to do things define your characters. Successful people who went on to accomplish great things in life are extremely determined people. Do you know that when Soichiro Honda first started his engine design, he got rejected by Toyota? But because of his determination, he went back to school for 2 years to study how to improve his design? When Toyota finally accepted Honda’s design, war broke loose and the contract did not go through. Honda’s factory was bombed, but he rebuilt it, but then again, it was flatted by an earthquake. Most people would have given up by this time, but not Soichiro Honda. During that time, steel was insufficient and most people used a bicycle to commute. So Honda installed his engine to his bicycle, and the first motorcycle was born. Honda wanted to manufacture motorcycle, but he did not have the capital to do so. Guess what, he hand-written more than 1,000 letters to bicycle sellers all across Japan to come up with a deal. And finally, someone accepted and Honda’s story became history. Do you have the determination like Soichiro Honda? Are you willing to do whatever it takes to achieve what you want (in ethical terms of course)? Here are a few great examples of people who have strong determination and simply refuse to quit, you can read it HERE. This is a long article and you have come a long way if you read until this point. I hope that you were inspired and gained insights and know what you need to do to reach for what you want right now. Successful people are able to accomplish extraordinary results in life because they possessed amazing qualities and characters that made them who they are today. Guess what, you can do it too. You can build and grow your characters, adopt the success traits and choose to achieve outstanding success in life as well. Follow the ideas in this article and adopt these qualities of successful people right now. So which quality here impacts you the most? Share your thoughts in the comment section below.